Hi! 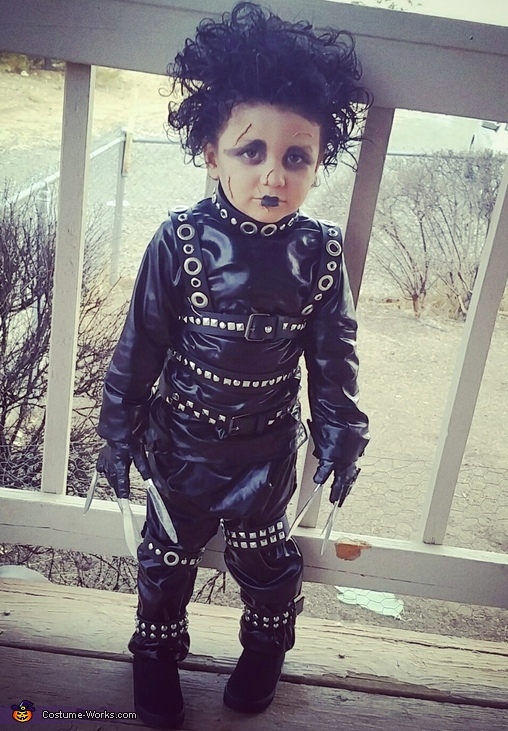 I hand made my sons Edward scissorhands costume! My sons name is David and he is 3 1/2 years old! I got the costume idea from a random picture popping up on my facebook! I went to wart and bought a plain black pair of sweats and a plain black colored shirt. Then went and bought 3 feet of the material from Joann's. Then I went and bought 4 adult plain black belts from the 99cent store and a bunch of the studs from walmart! I cut the fabric to fit then used fabric glue to glue it on the sweats and shirt. Then I got the belts measured them out and cut them. I added the studs by pushing them into the belt one by one. Then I used wire to connect all the belts. The belts are not attached to the clothing.I got a pair of kids gloves from Walmart and black electrical Tape also plastic knives. I put the gloves on his hands and attached the knives with the electrical tape. Before that my husband rotoziped the knives to make them skinnier. I got 7 dollar Walmart shoes and spray painted the bottoms black, which were white originally. I used all my own makeup on his face. for the scars I used rolled up pieces of toilet paper and stuck them on with my eyelash glue! Them makeup over it of course! And his hair is naturally a mess! So I just blow dried and used the hair spray paint to make it black!